Generally when I try someone else’s recipe I end up changing it to meet my needs. Normally I don’t like it exactly the way it’s written. That’s still technically true here (I changed 2 things), but I really didn’t change much, and they turned out amazing! Yesterday I was catching up on some of my favorite blogs. This usually starts with Oh She Glows. I have had great success with Angela’s recipes, but lentil mushroom walnut balls didn’t fit my mood. I was in a I’m-not-so-sure-what-I’m-doing-with-my-life kind of mood, which calls for something a little different. Something comforting, baked, sweet, and definitely not good for you. Then I visited Smitten Kitchen. I own her cookbook and I have had huge success with her mushroom bourguignon. And Deb didn’t let me down. 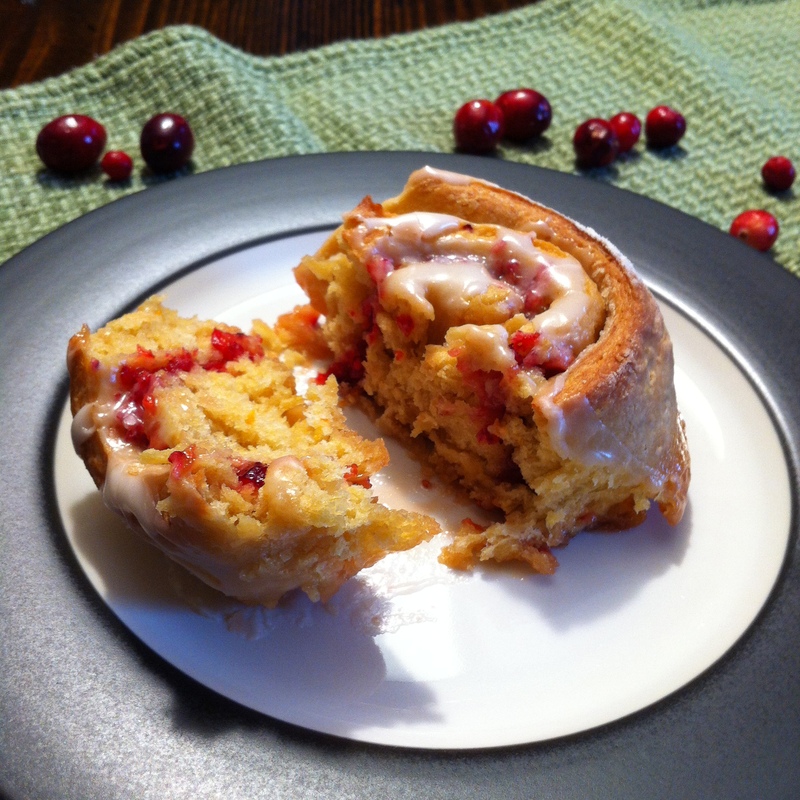 Her Orange Cranberry Breakfast Buns inspired me to run out to the grocery store last night for oranges and cranberries (which took forever to find, darn you giant midwestern grocery stores!). 1. Whisk together the egg yolks, egg, sugar, melted butter, almond milk, and 3/4 of the orange zest. I used my stand mixer that I love, but you can do all of this by hand if you like/need. Add 2 cups of the flour, yeast, and salt and mix until it’s pretty evenly mixed. If using a mixer, switch to a dough hook to knead in the rest of the flour – 1 3/4 cups – on low speed for about 5-7 minutes. We don’t want a sticky dough, just nice and soft and a little moist. 2. Place the dough in a oiled bowl (the mixing bowl you just used will do nicely) and cover with plastic wrap. *If you are in a rush like I was, place a glass dish with about a cup of water on the bottom rack of your oven. Preheat the oven to a low temperature, around 200 degrees. Once it’s warm, turn the oven off and put your bowl of dough on the rack just above the pan of water. Let it rise in here for about an hour. 3. While the dough is rising, prepare your filling. Mince the cranberries in a food processor if you have one, with a knife if you don’t. You want them chopped pretty fine, but not to the point of becoming a puree. Measure your brown sugar, melt the butter, and relocate the rest of the orange zest (these should all be kept separate at this point). 4. Butter a 9×13 baking dish, preferably glass or ceramic. Dump your dough on a floured surface and press it out until it is roughly 18×12. Brush the dough with the melted butter, evenly spread the brown sugar on top, then sprinkle the cranberries on top of that. Finally, sprinkle the rest of the orange zest over the mixture. 5. Starting with your long edge, roll the dough up as tightly as you can without stressing over it. Using a sharp knife, cut the log in half. Cut those halves in half. Then cut each piece into 3 even pieces, leaving you with 12 rolls. Place them in the buttered pan and cover with plastic wrap. Put them in the fridge and leave there overnight (or up to 16 hours). *What is “overnight” you ask? Turns out 6.5 hours is long enough. 6. Pull the rolls out of the fridge and let them sit for 30 minutes to warm up slightly. This is a good time to take a shower. Preheat your oven to 350 degrees. Bake for 30 minutes. While they bake, mix up the orange juice and the powdered sugar until you get the consistency you like. I like it runny enough that I can drizzle it, but thick enough that some will still sit on top of the rolls. 7. When the rolls are done, put the pan on a cooling rack and let them sit for a bit to cool, if you can. I lasted about 2 minutes and then dragged the husband in to see what I did (he was ok with this). Drizzle/spread your icing and enjoy! *I strayed from the instructions due to my inability to fully read the instructions before starting the recipe. I really didn’t want to be up until 1 am preparing these rolls. For the original instructions, visit Deb at smittenkitchen.com.